Good day, and welcome to "The Gods Are Bored!" This is the site where we designate deities to duties that need to be done. Yes, reader, you too can become a Prayer Warrior -- just choose a God or Goddess who will heed your call, and then pray your heart out. And boy, am I praying today! I've had the scouts out everywhere, looking for Ma'at, the sacred ancient Egyptian Goddess of Truth and Justice. Used to be, I didn't have a bit of trouble getting such ancient and venerable deities to join me for a bracing beverage and a fireside chat. In these times, They are not as accommodating. My first message from Ma'at was: "Busy sorting wing feathers. Call me back when that lying sack of sated dung beetles is no longer your leader." Can you blame her one bit? But I petitioned again, more urgently this time, and she has joined me for scones. 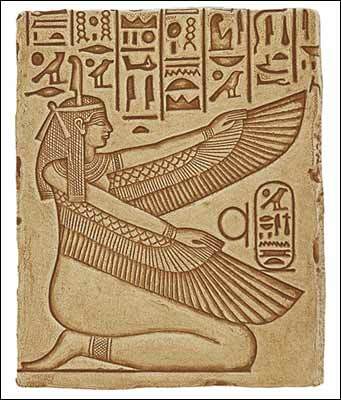 Please give a warm, wonderful, "Gods Are Bored" welcome to Ma'at, Goddess of Justice! Anne: Thank you so much for coming! You must be furious about the lack of justice in America right now. Ma'at: Honestly, Anne? When was America ever a just nation? Just because Americans recite "and liberty and justice for all" every damn day doesn't make it happen. Anne: You've got a point, o winged wonder. But Ma'at ... I've been searching high and low for you because America needs you, right now! It's a small but crucial assignment, and I sure hope you'll accept it. Ma'at: Well, tell me what it is, and I'll check my Outlook calendar to see if I'm available. Anne: Snap, I'm impressed, Goddess! I can't figure out Outlook calendar to save my life! Not surprised deities can do it, though. 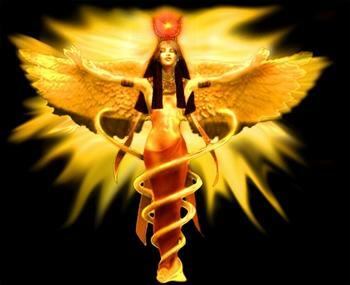 Ma'at: So, what is it, and when do you need me? Anne: It's this, and I'm about 10,000 times more serious than usual: Our great justice, Ruth Bader Ginsburg, is having health problems. She's 85 and still on the job -- trying to hold out for a sensible president to replace her, instead of the Orange Gibbon currently in charge. Ma'at: 85, you say? That's advanced age, right there. Any kind of health problem or surgery can really take a toll on a person of that many years. Anne: I know, I know! I'm worried sick! Ma'at, will you please, please, please drop whatever else you're doing and take up protective watch over Ruth Bader Ginsburg? Ma'at: That's a pretty cheeky request, Anne! You think I don't have anything else to do? I'm busy all the time! I have a thriving praise and worship team, not to mention all the superior art work to supervise. Anne: Dear Goddess, it is with the utmost humility that I approach you and petition you to protect Justice Ginsburg. I'll put it to you this way: Who cribbed your holy edicts and passed them off as original? Ma'at: The Judeo-Christians, that's who! Anne: Well, a good passel of them are praying that Ruth Bader Ginsburg dies. Ma'at: Say no more. I'll put my other appointments on hold. Where can I find this Justice Ginsburg? Anne: Washington, DC, I think. She works there, and if she's resting at home, I assume her home is there. Not sure, though. But you're a Goddess, Ma'at! You can find this person, can't you? Ma'at: Consider it done! However, I require something from you (and whoever else reads this) in return. Please petition Me to do this important job. I want to be recognized for my contributions to *ahem* American "justice." Although I am not American, I too petition the Goddess Ma'at to preserve and protect Justice Ruth Bader Ginsburg! The USA has fallen far enough into barbarism as it is. The world needs America to stabilize itself back to solid liberal values. RAMEN! ma'at, keep the notorious RBG under your strong wings of protection. RBG needs all the positive vibes she can get. I am hopeful she can fulfill her duties for a couple more years, retire, and go off to enjoy her retirement confident that she left things better than she found them. Great Goddess Ma'at, please keep Justice Ginsburg safe and protected. We need her wisdom more than ever. You are so right! I'll lay out a glass of Medeira and a plate of cheese for Pan - Even if it doesn't work he would be fun to hang out with.